Constructed from durable heavy weight cotton canvas material. Super large main compartment without a zipper closure.Two side pockets - one pocket on each side, with snap closure. (great for bottles, pens, shirts etc). Under flap - two large pockets. Close the flap with a hook and loop closure. Small zippered pouch inside for smaller items. Shoulder strap that is fully adjustable (40" long x 2" wide). Heavy duty stitching all around. Durable, Heavy Duty, Spacious Messenger Bag. Approx Dimensions: 15" x 11" x 6" (W x H x D). Ensures comfort to people carrying heavy and/or bulky items, while allowing easy access to the contents. 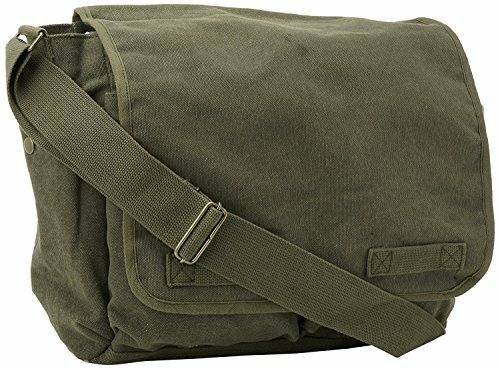 Sometime referred to by cyclists as a messenger bag and or courier bag. These bags are unisex and worn by both genders.